Smartphone shipment growth has dramatically declined since 2014 to just 3 percent this year, indicating that almost everyone who wants or needs a smartphone now has one. Investment in Ads on Mobile devices​ has increased significantly YoY coupled with the first decrease in investment in Desktop Ads. Just looking at this slide from the 2016 report vs the 2017 report Meeker put together you can see of the $22 billion opportunity on mobile there was in 2016 – advertisers have taken advantage of the opportunity. Slowly we are closing the gap between where consumers are spending time and where advertisers are spending money. Ecommerce growth is up 15% YoY in the United States. While we may be very focused on the United States we can’t ignore the growth in China. Commerce grew 24 percent in China this year compared to 15 percent in the U.S., as China shifts to online shopping faster than other countries, led by giants like Alibaba with 570 million mobile monthly users. Google and Facebook have a combined share 85% of the estimated $72B invested in digital advertising this year. This tells us where everyone is investing there money but is troubling that two major players dominate so much of ad spend that is out there. Google PLAs now account for 52% of Paid Retail clicks on Google – up from just 29% only 2 years ago. Mary Meeker forms an interesting hypothesis about the future: The future of search is about pictures not keywords. In the future Meeker goes on to speculate that voice and imagery will replace typing. These are just some of the many facts you can find in Mary Meeker’s great report. She dives into trends in gaming, trends in China & India and more. What’s your company’s Amazon Prime? What makes your company stand out from all the rest? Of course while this is a long list, the truth is most Prime members probably only signed up for one of these, the free shipping. This perk really stands out when you look at the vast variety of products on Amazon. One can understand why it’s a compelling reason to buy into this especially if you’re making multiple purchases online a month. What’s even more intriguing is due to this perk you are more likely to pick Amazon over any other website where you can buy the same product. This helps Amazon increase it’s market share even more. As you scroll down the other items on this extensive list you likely will have no idea what many of these services are or at least you weren’t familiar when signing up for Prime. This is brilliant on Amazon’s part because it continues to delight users with new Prime perks which one by one introduce Prime members to new Amazon services. And that’s really it in my opinion, if you can delight new customers from the first purchase you’ve got them for life. So what’s your company’s Amazon Prime? What is so great about this question and tactic is it warrants the other person responding with no but also it triggers the other person’s natural human aversion to loss. This question also has a certain “finality” to it that makes it clear you will walk away if this person does not reply since they have “given up.” All in all this is just one good example where getting told “no” is a good thing. Accusation Audits This one seems to be more obvious but still worth mentioning. When walking into a negotiation address any accusation the other party will likely bring up (or be thinking) early on. Addressing any accusation they could throw at you allows you to answer their concerns up front. “That’s Right” Two words with a great deal of power. When someone says this you make them feel like you understand them. A great way to do this is to summarize or paraphrase what they’ve just said to you. Never underestimate the power of letting someone know they’ve been heard. The most important thing here is even if you completely disagree with the other person by letting them know you heard them and getting that person to agree with you – you’re making them comfortable. “How Am I Supposed To Do That” This is my favorite of all the techniques in the book. Voss brings up many hostage situations and real-life situations where he simply keeps replying asking the other party to answer how they are supposed to meet whatever demands are being made. This makes the other party think about the situations and slowly begin to make concessions. All in all this book was a really great read that I would highly recommend. If you’ve done a search in Google recently you’ve probably noticed there is a lot more going on on that SERP (search engine results page). As I mentioned in my last post, with the new beta test it looks like Google Posts also previously nicknamed by the SEO blogosphere “local business cards” will be adding more engaging elements to a branded search. 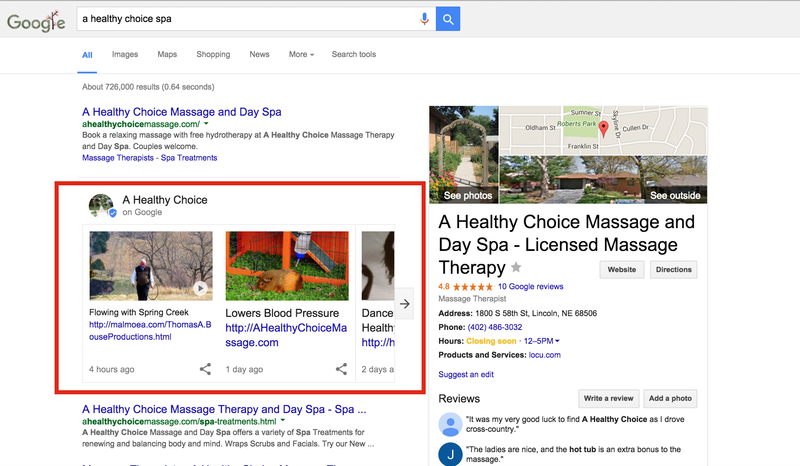 A picture below depicts a branded search for “A Healthy Choice Spa” (a local business part of the beta test of Google Posts). The Google Posts take up prominent real estate right below the first organic spot. One thing not as obvious in this screenshot is the fact that the photos in this Google Post are in fact gifs, which you can check out here. The only thing that is more eye-catching on the page appears to be the local knowledge panel. The Knowledge Graph is a knowledge base used by Google to enhance its search engine’s search results with semantic-search information gathered from a wide variety of sources. So you’re probably wondering at this point will anyone ever get to my website if they get the answer to their question from Google? There are few things to take into consideration. The knowledge graph does not exist without websites from which to not only pull information but to confirm the “accuracy” of that information. For the most part the knowledge graph appears most on queries that are relatively broad questions or general questions without high user intent to take an action. That being said, if the user is able to find their answer more quickly this leaves more qualified users coming to your website. A good example of this would be to imagine someone querying a treatment for a medical condition. With a knowledge graph answer they can more quickly understand what treatment they need and seek out pharmacies or doctors to him or her attain that treatment. Sometimes Google gets it wrong. Just today, a coworker brought to my attention that the knowledge graph was serving up a not so helpful quick answer. A query for fashionable jackets yielded this result you can see to the side here. So even as much as Google may try, in this specific instance the user is probably going to click on another result on the page. 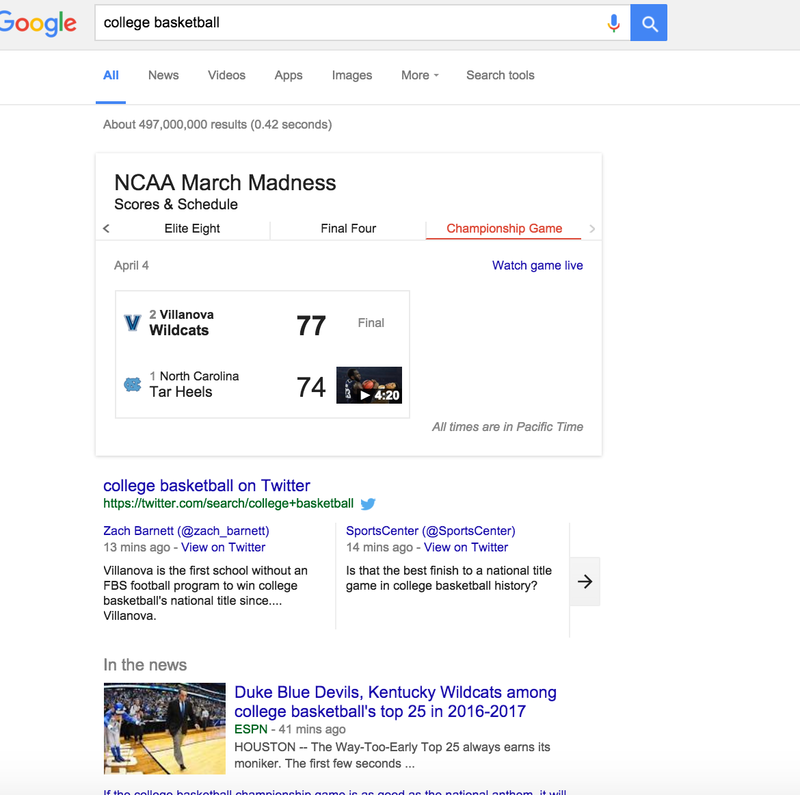 While the knowledge graph is a tremendous part of the modern SERP, it’s just one part of a bigger picture. Now with tweets pulling into SERPs, Ads, local packs, organic sitelinks, and more (for which Moz has a great breakdown ) the SERP has become a much more engaging, user-friendly place. So friendly in fact that I believe that the modern query, specifically the branded query, is the new homepage of your website. It’s easier to type your business into Google than to navigate to or remember the exact URL. When a user does that search they can get your contact information, hours, reviews, and figure out the best time to visit you to avoid the crowds. You may have sitelinks on your organic listing or your paid ad likely outlining your key service or product pages. In a lot of way your sitelinks have become your website navigation. If you’re running ads or if your number displays in your local knowledge panel it’s even possible for the user to go ahead and with the tap of button on their mobile device call you. The best part is they never needed to go to your homepage! Your branded query sold your business to that user. I view this shift in search that’s been underway for a while now as a tremendous opportunity to dominate your branded SERP. In fact there are more ways than ever to showcase your business in Google. This means investing in ads, updating your Google My Business listing and making sure the best pages are showing up in those first results. Google’s entire search business relies on there being websites to search for on a daily basis. Google wants to keep users on their search engine by creating a user-friendly search experience which at the end of the day is to your website’s benefit as well. Besides if you don’t take advantage of your branded SERP, there’s always a chance a competitor will. In a lot of ways Google SERPs are going through a “spring cleaning.” Out with the old features and in with the new. 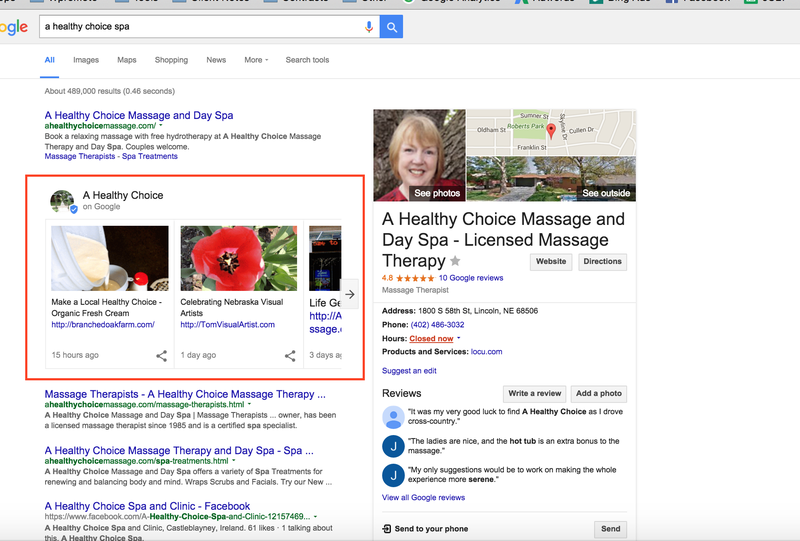 Last month we bid a fond farewell to right-column ads, this month we got introduced to Google Local business cards (still in beta). Local business cards (given this name but the SEO blog world not officially by Google) are a fantastic blend of the immediacy of social media platforms such as Facebook and Twitter, with the authority of those top spots in Google. A snapshot of what these look like is in my screenshot below. The barrier I see at least currently is how effectively the average small business will be able to leverage this? I can definitely see these local business cards being updated once and never changed again. I would assume this isn’t what the intention is at all. I’m interested to see exactly who will use these and if cards from only one business be allowed or multiple ones. It’s worth noting that these cards are similar to candidate cards which Google rolled out in January of 2016. If the system works like candidate cards work then each candidate ,or in this case local business, can push information to the cards but over time based on Google’s algorithm Google will decide which ones display first. 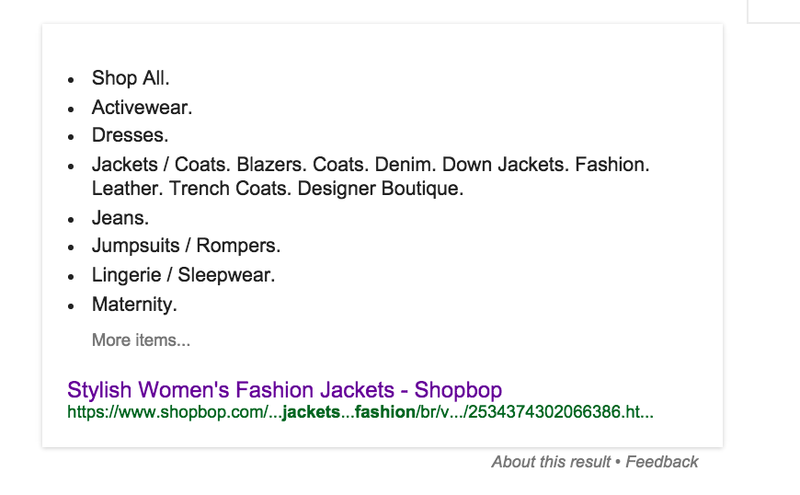 All of this has me and probably a few others wondering are the SERPS too crowded? Let’s not forget AMPs, accelerated mobile pages, rolled out recently as well. If we imagine a SERP world filled with AMPs, local business cards, knowledge graph results and ads just think about how crowded the space will get. All of this considered, I guess getting rid of those right-column ads is making even more sense in light of these new features. Google’s recent move to take right column ads took a lot of advertisers by surprise. A lot of us saw the negative in this announcement – less ad inventory on SERPS, higher CPCs, and more competition. So let’s address these concerns one by one. True, there is less ad inventory on the first page. However, only about 85% of all clicks were going to the top ads anyway. So while the ads won’t show on the side your ads probably weren’t getting clicks the majority of the time anyway. By giving your ads better visibility and a better chance of getting clicks you’ll have a better shot on a high quality score and ultimately driving traffic to your site. Not true, yet. Google has shifted the spots on the page to be at the very top but also the very bottom of the page. This makes those coveted spots at the top, above-the-fold so much more valuable. Therefore, it’s reasonable to assume that we’ll have much higher cost per clicks. It’s too early to tell if this will truly happen. Somewhat true. Inevitably there is going to be more competition since there are fewer ads above the fold. To combat this Google is adding a “fourth” ad spot at the top for “highly commercial” queries. This presents a unique opportunity for small to medium size businesses who may not be going after “highly commercial” queries. With just 2 or 3 ads at the top this draws even more attention to that first organic spot on the page or the local pack. So how will you take advantage of this opportunity? Facebook Canvas has finally been released to the general public! Facebook Canvas solves a pain point for many advertisers, their landing pages. Now Facebook gives businesses the ability to send users who click their ads to a customized and mobile-friendly landing page within Facebook. These landing pages within Facebook load as much as 10 times faster than the standard mobile website. The steps for setting up a Canvas are here.